It takes a great deal of talent and energy to brew great beer. It also takes a unique set of ingredients to create today’s craft lagers and ales. Some of these raw materials can be spelled out in recipes—hops, malt and yeast—while others, like the knowledge to build a killer beer list and train bar wait staff, are just as vital to our enjoyment of great beer. As the beer served at American bars has changed during the last generation, so too have the necessary inputs to meet the growing thirst among consumers for more flavorful brews. This means a shift in the supplier networks to meet the boutique needs of brewers. It has also meant the need for a vast increase in the knowledge base of the beer community, with training for servers that rivals what restaurants with a focus on fine wine have considered critical for decades. Ralph Woodall first became acquainted with hops as a teenager when he worked the fall harvest as a seasonal job. Forty years later he is still finding new things to talk about when it comes to the conical flower. Woodall, 57, took a job with what is now Hopunion in 1983. The company, known as Western Hop Co. at the time, has changed hands five times over the years and along the way Woodall has watched the birth of the craft beer community in the United States. Then the craft beer business “exploded,” he says. We had the inside track on working with craft brewers, knowing the hops they were using and dealing with smaller quantities,” Woodall says. By the mid-1990s, craft brewers had become the major share of the Hopunion business in the U.S.
Woodall worked as a traffic manager at Hopunion in the early days, growing into the position of director of operations responsible for production and warehousing. He could see the explosion happening in the craft beer segment by the daily shipments waiting for the UPS pick up. 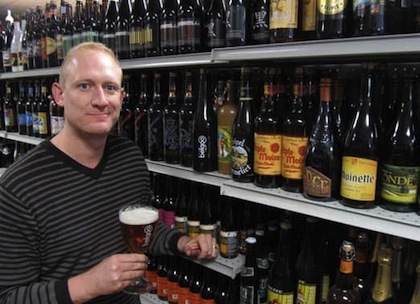 Woodall became director of craft brewing sales for Hopunion’s Craft Division in 1997, a job that allowed him to travel the country and meet scores of brewers. Woodall also looks back to hop varieties like Centennial, Columbus, Chinook, Amarillo, Simcoe and Citra, and can trace their success to pioneering brewers and creative beer recipes. Things really changed when hoppier beers started coming into play. There was a real evolution in beer styles and a new appreciation for hops among brewers and consumers,” Woodall says. Woodall notes that the changes in the hop market during the last couple of decades have not been without challenges. The most notable was the hop shortage that took place in 2007. He said that crisis made it clear to all involved that there is a need for a balance between farmers, dealers and brewers in trading in an agricultural commodity. The economic downturn in 2008 signaled the end to increased hop demand. However, as prices have gone down, growers again reduced the amount of hops that they have planted. At the same time, beer sales have rebounded. It was a real difficult last three years, but now we are seeing sustainable pricing for growers,” Woodall says. According to Woodall, the 2010 crop came back from a cold, wet spring that delayed the growing season. A hot summer meant an average yield, but overall acreage has been reduced by as much as 20 percent in key U.S. growing regions. The result is that there may be some spot shortages of certain varietals, which will be further exasperated by demand for some hops favored for India pale ales. The harvest of imported hops is mixed due to weather conditions in August, but a surplus of hops from the 2009 harvest will help fill the gaps. Hops have a way of coming through,” Woodall says. Chris White got into homebrewing as an undergraduate at the University of California, Davis. When he came to San Diego in 1991 to go to graduate school he got “lucky” and became friends with some of the future heavyweights of the Southern California brewing scene. I was just very lucky. If I was not in this city, none of this would have ever happened,” White says. What happened was the start of White Labs Inc., one of the leading suppliers of yeast to craft beer makers, wineries and distilleries. White Labs now has more than 1,000 customers. In the early days, White sold yeast to a local homebrew supply store in San Diego. Now more than half of the yeast White Labs sells is shipped east of the Mississippi and the company sells to brewers in 60 countries. White, 42, is constantly on the road, spending just five to 10 days a month in San Diego. Most of the yeast the company propagates is sold to commercial breweries, although homebrewers in the U.S., Canada, Australia, the United Kingdom and Germany remain frequent customers. In addition to building a collection of yeast strains that it markets, White Labs also serves as a yeast bank for brewers and distillers. The company stores the frozen yeast as a safety net for brewers in case the yeast at the brewery develops a defect. It’s been fun because the brewing industry in San Diego has grown up along with White Labs, and the rest of the country has also had remarkable growth among craft brewers,” White says. White recognizes that many consumers think about hops and malt in their beer but don’t give the yeast much of a thought. White says he expects the craft segment of the industry will grow to be more than 10 percent of the market. Penny Pickart had no brewing or beer industry experience when she decided to take a job with Briess Malt & Ingredients Co. 14 years ago. I’m a local girl. I kind of just fell into the industry,” Pickart says, who switched from a career in financial services. She started in the customer service operation at Briess, but soon moved over to sales. Pickart’s job involves working with brewers on beer formulation, answering questions about malt and troubleshooting brewing issues. I’m the internal voice of the brewer at Briess,” Pickart says. Pickart, 48, attended the Siebel Institute to learn the science behind brewing and her sensory talents have resulted in her serving as a beer judge during the last six years for both the Great American Beer Festival and World Beer Cup. If you would have told me I would be judging beer as part of my job a few years ago I would have said, ‘I’m not that lucky,’” Pickart says. Pickart’s sales territory runs from Michigan and the Dakotas, down through the center of the country to Texas. She spends about 50 percent of her time on the road visiting breweries and meeting with customers. Brewers are always looking for something new and exciting,” Pickart says. Briess markets more than 60 different varieties of malt, which she says is the largest selection of any malting company. Most of the malt that Briess makes comes from barley grown within a 20-mile radius of the company’s Wisconsin operations. Pickart says she was attracted to Briess because of the family atmosphere. “I was drawn to the industry by this company. Monica Briess is a great leader,” Pickart says. “It’s more than just a job.” She says the friendly attitude extends beyond Briess and permeates the industry. We are making some of the best beer in the world right here in the U.S. People should drink local. They should drink fresh beer,” she says. Andrew Van Til knows a thing or two about beer. And he has the paperwork to prove it. Van Til, who is an account manager with CKL Corp. in Michigan, was the first person to earn the certified Master Cicerone designation in 2009. The Cicerone program for beer servers is similar to the certification process that a sommelier goes through to show a superior knowledge of wine. Van Til is 33 years old and holds a degree in chemistry. He worked as a bartender and has been around the business for a decade. The Cicerone process has three levels: certified beer server, which is a 60 question written test; Cicerone, with a written exam and blind tasting; and Master Cicerone. The test to achieve the Master Cicerone designation requires two days and includes essay questions, an oral exam and a tasting panel component. People in the beer industry are so friendly. They all compete, but they are willing to help,” he says. The training process to prepare for the Master Cicerone exam included plenty of reading and beer tasting. I had a pretty good foundation in beer, but it was important that I set goals for preparation and study time,” he says. Juggling a young family and a busy job made preparing for the exam even more difficult. Anyone considering taking the exam should talk to a local brewer and ask for help in building their understanding of beer. Van Til loves to talk beer. He says he is starting to see a greater understanding of beer in the market, which will lead to further growth among craft domestics and import. The evolving and expanding craft beer segment requires constant feeding. Quality raw ingredients for brewing, trained brewers, educated servers and informed consumers are bringing about a deeper appreciation for both classic and new beer styles. The future of the industry depends on this fuel to keep the river of great beer flowing. Rick Lyke is the author of the Lyke2Drink blog, which has been covering all aspects of beer, wine and spirits since 2006. Oh, Ye Biere Styles, Where Goest Thou Now?